You know when we have a birthday it’s time to bust out the sprinkles! I recently bought 7lbs of ’em from Amazon so I am locked, loaded, and ready to go! 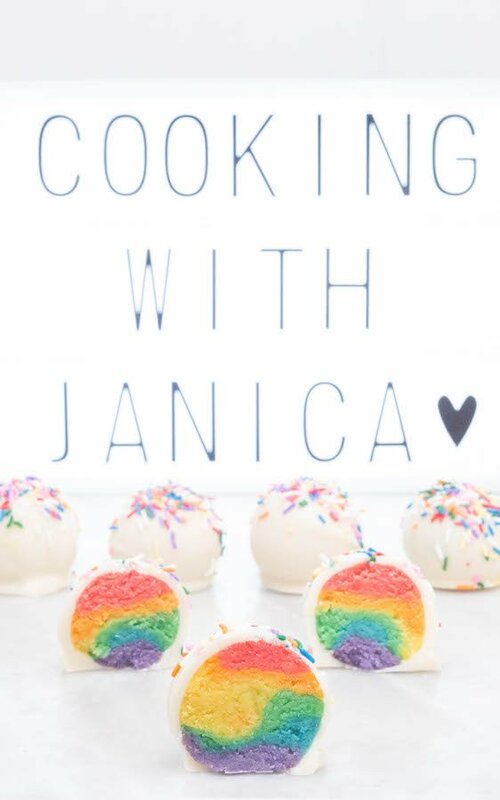 What better way to celebrate turning three than with a few rainbow cake truffles??? 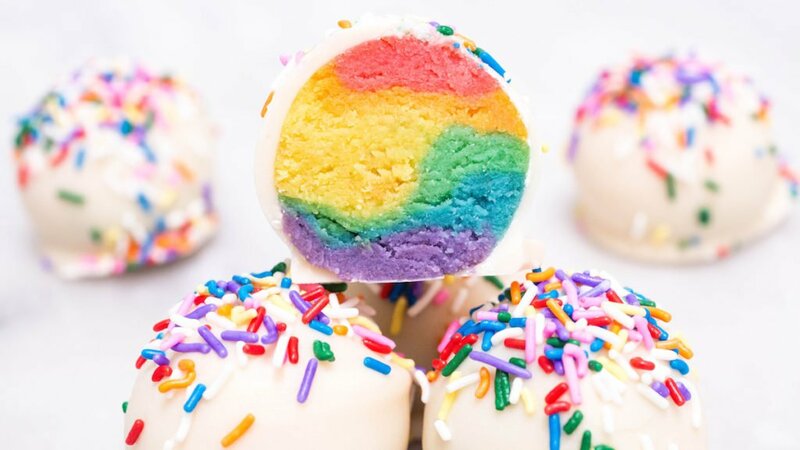 These sugary, colorful treats are basically a cake pop without the stick. We took the first test batch to a housewarming party and they were devoured! Janette took the second batch with her to work at Big Brother, where they were given rave reviews. I think it’s safe to say you’re gonna love ’em! Some people have suggested we name them “unicorn eggs”, but I always assumed unicorns are mammals and therefore do not lay eggs. Perhaps I’m just overthinking it? Regardless of what you call these little treats, they’re delicious! And I don’t know what it is about rainbows, but just looking at the colors puts a smile on my face! It’s become a tradition to list our favorite recipes from the year on our birthday post. It’s always so fun to go back and see what we spent the year making! It’s always neat to see the recipes that were our personal favorites versus the ones you guys were most into, so below are the posts that got the most traffic this year. Wondering what kind of milestones we hit this year? Millions of people visited our site, the most we’ve ever had in a single year! The sincerest of “thank-yous” to all of you who have visited our site, shared a post, or made one of our recipes yourself. It has been so much fun sharing the food that we enjoy with all of you! We can not wait for you to see what exciting stuff we’ve got coming down the pipeline this year! Preheat oven to 350 degrees F. Place 12 cupcake liners in your muffin tin. Mix packaged white cake mix according to directions. Divide the batter evenly between 6 small bowls. Tint each bowl a different color. I dip a toothpick in the color, then dip and stir it into the batter. Repeat until the desired tint is reached. Use the golden yellow and a little red to achieve the orange color. Add the batter to your muffin tin. Each color will make two cupcakes. Bake for 12-15 minutes, until a toothpick comes out clean when inserted in the center. Allow to cool completely. When cool, crumble each color of muffin into its own small bowl. Add 1 Tablespoon of frosting to each bowl and stir until combined. You can take a small amount of each color into your hand then gently roll them into a ball – or I found it easiest to roll each color into 1/4″ balls, then roll & smoosh the balls together to form the truffle. Place on a baking sheet lined with parchment paper. Place in the freezer for at least two hours. Once chilled, melt your chocolate. I do this by putting the chocolate melts in a microwave-safe bowl and microwaving for 30-second intervals, stirring in between – until completely melted. When chocolate is melted and smooth, remove the rainbow truffles from the freezer. To dip, place a toothpick in the top of each truffle, dip in the chocolate, turn gently to coat, then remove from chocolate and gently turn again to allow the excess to drip off. Place truffle on a baking sheet lined with parchment paper and carefully remove from toothpick (I used another toothpick to push down while pulling up on the one in the truffle). Quickly cover with sprinkles. Allow chocolate to harden (you can chill in the refrigerator to speed up this process). Store in an airtight container for up to 3 days. I like looking at rainbows, too. 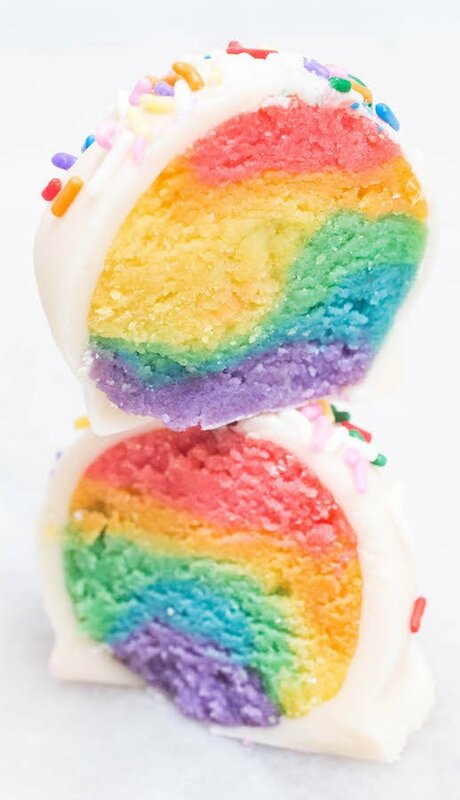 These cake truffles are very pretty. My youngest son has already requested that I make some of these for his Easter basket. These are a great idea. Thanks, Patti! Awww, I hope your son enjoys them. I love that you make homemade treats for his Easter basket! These are so pretty and colourful! Kids would have so much fun eating these! How did you get those perfect layers? I am in awe! These are so fun and pretty!! I love the use of white chocolate ( my favorite )… I’d love one right now! Those cookies – bon bons are amazing. I love how they look. Wouldn’t they be adorable for a baby shower or wedding shower. A tea!! Golly I can think of so many things. You did a marvelous job. And Happy Birthday to the site! Those are milestones – congratulations. These are LITERALLY the prettiest truffles I’ve ever seen! I’m working on a unicorn cake for a friend’s birthday this week and the guest list just keeps getting bigger and bigger. I’m concerned my cake just won’t be big enough so I think I’m going to have to throw in some of these gorgeous truffles. They’ll fit in perfectly! 7 lbs of sprinkles, it’s like a couple of years’ supply, eh?! 😉 Congratulations on the milestones! My first thought when I saw the rainbow colors was — ‘Now, those would look good for Easter too.’ Kids would love them for sure! These are the CUTEST little cake treats! I wish I had seen this a few weeks ago, my daughter turned 3 and wanted everything to be “rainbows and so many colors”. These would have been perfect! I’ll just have to make them for St. Patrick’s Day! Wow! 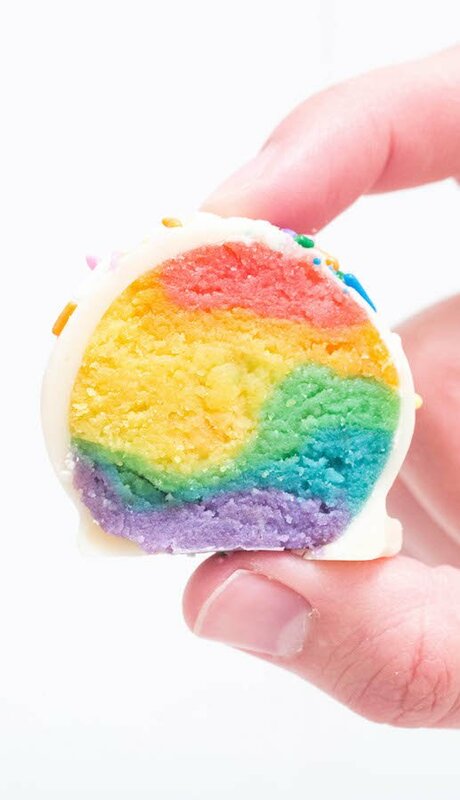 These rainbow truffles are amazing, I can see why they were such a hit. I haven’t had a chance to make any unicorn baking recipes yet since the trend started but I think these will be perfect for an upcoming potluck.